A message, name, number, etc. is displayed. If “BT” is not displayed, the Bluetooth® audio system cannot be used. By following voice guidance instructions output from the speaker, voice commands enable to the operation of the Bluetooth® audio system without the need to check the display or operate . Press and select “BT•A MENU” using . Press the talk switch or select “BT•A Setup” using . The introductory guidance and portable player name registration instructions are heard. Select “Pair Audio Player (Pair Audio)” using a voice command or . 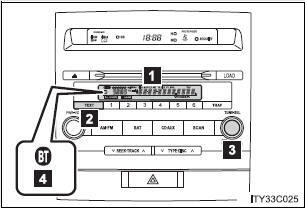 A passkey is displayed and heard, and a voice guidance instruction for inputting the passkey into the portable player is heard. Input the passkey into the portable player. Refer to the manual that comes with the portable player for the operation of the portable player. If the portable player has a Bluetooth® phone, the phone can be registered at the same time. A voice guidance instruction to register a Bluetooth® phone is heard. For numbers, say a combination of single digits from zero to nine. Say the command correctly and clearly.